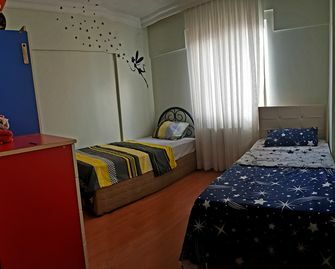 Experience the unique character of Pendik with a stay in a vacation home rental. Well-liked for its cafés, spas and bars, this city is both relaxing and walkable. Topkapi Palace and Hagia Sophia are just a couple of the must-sees in the area. Whether you're planning a family vacation, friends trip or romantic retreat, HomeAway has a great selection of vacation homes. Many rentals come with a full kitchen and separate dining area, perfect if you need a space for entertaining. The nearest airport is in Istanbul (SAW-Sabiha Gokcen Intl. ), located 4 mi (6.4 km) from the city center. If you can't find a flight that works for your travel itinerary, you might consider flying into Istanbul (IST-Ataturk Intl. ), which is 27.8 mi (44.7 km) away. If you prefer to travel by train, Istanbul Tersane Station, Istanbul Kaynarca Station and Istanbul Guzelyali Station are the main stations in the area. Where to stay around Pendik? Our 2019 accommodation listings offer a large selection of 187 holiday lettings near Pendik. From 6 Houses to 178 Studios, find unique self catering accommodation for you to enjoy a memorable stay with your family and friends. The best place to stay near Pendik for a long holiday or a weekend break is on HomeAway. What are the most popular points of interest and landmarks to stay near when travelling to Pendik? But there are many other points of interest around Pendik listed on HomeAway where you can find your place to stay. Please use our search bar to access the selection of holiday rentals available near the point of interest of your choice. Can I rent Houses in Pendik? Can I find a holiday accommodation with pool in Pendik? Yes, you can select your preferred holiday accommodation with pool among our 28 holiday homes with pool available in Pendik. Please use our search bar to access the selection of holiday rentals available.